Due to our delayed flight, it was dark when we arrived in Kyoto. This created a beautiful welcome to Japan. 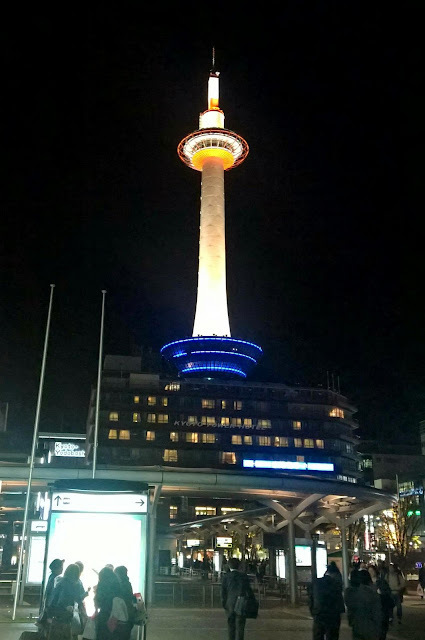 Kyoto Tower lit up the exit from the train station and coloured fountains of water banked the side of the walk way - I already knew that I would love Japan. The following morning we discovered that the Japanese love fluffy American pancakes for breakfast - heaven! We moved our stuff to our new hostel and ran into a 70 year old (ish) woman, she walked slowly with a bend in her back. She left her house and climbed onto her scooter and instantly headed off at full speed, it was surreal - how often do you see older people doing things like that in the UK? We set off to begin Temple day! 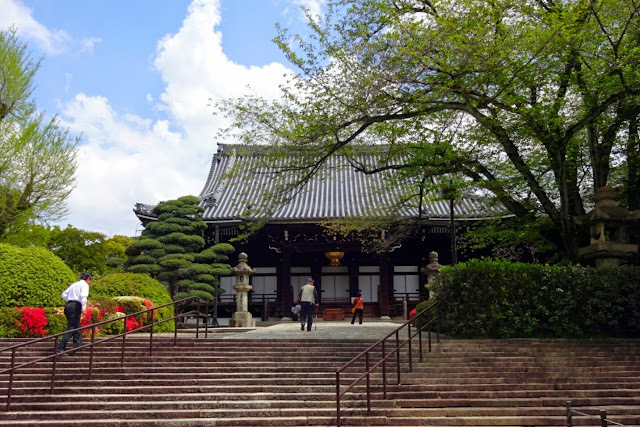 Although not technically a temple, our first stop was Otani Hombyo - a huge crematorium with really pretty buildings and gardens. When we got to the burial area the number of gravestones was astonishing - they were all new looking and so clean. Behind the crematorium was our first temple of the day - Kiyomizu Temple. This idyllic temple was located amongst thousands of tree on the side of a mountain. The Temple itself was a bright orange - such a contrast to the temples we saw in China and South Korea. The Temple was full of touristy shops selling charms for love, marriage, exam success and even to remove headaches. 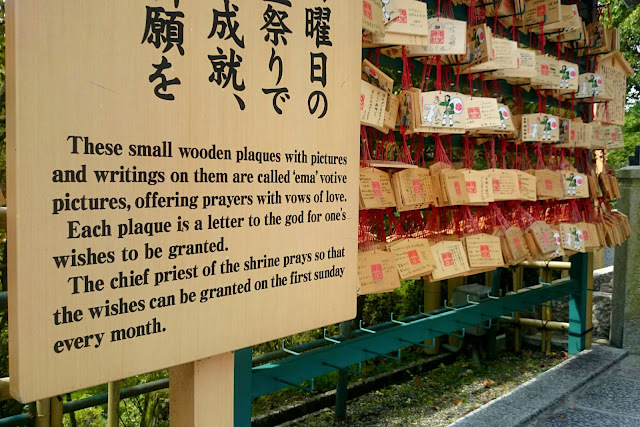 My favourite things were wooden plaques where you could write a wish and a monk would bless it - potentially making it come true. I saw one wishing her daughter a safe and happy pregnancy. Leaving the temple lead to a series of pretty streets called Higashiyama Streets. These streets were small and windy, but mainly aimed at tourists with several shops selling the same merchandise. 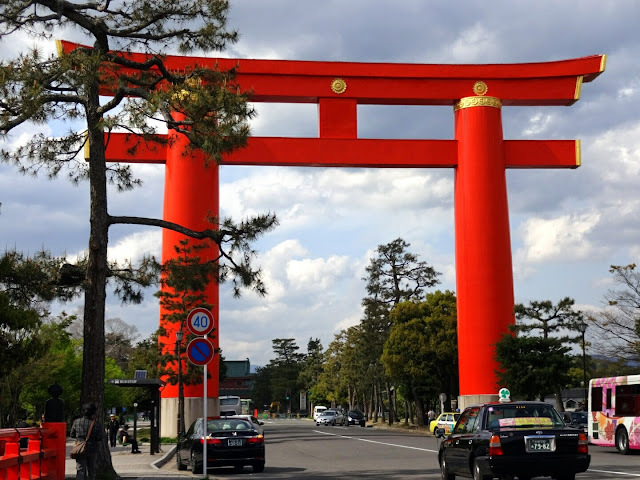 Our next stop included walking through a huge Torii gate (a big gate which looks like the Greek letter pi) which was also bright orange and lead to the Heian Shrine. The main entrance way was a huge open space with pretty buildings around the edge. It is also known to have the best Cherry Blossom garden in Kyoto - unfortunately the ticket office informed us we were too late and the petals had fallen from them. On the way to the Philsopher's Path, we ran into a Japanese man who wanted to record us reading an English poem and ask some questions about its grammar. The politeness of the Japanese is unreal - this man was so kind, recommending places we should go and talking to us. 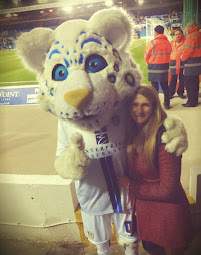 Everyone also nods at people as a sign of respect - they are just so polite! 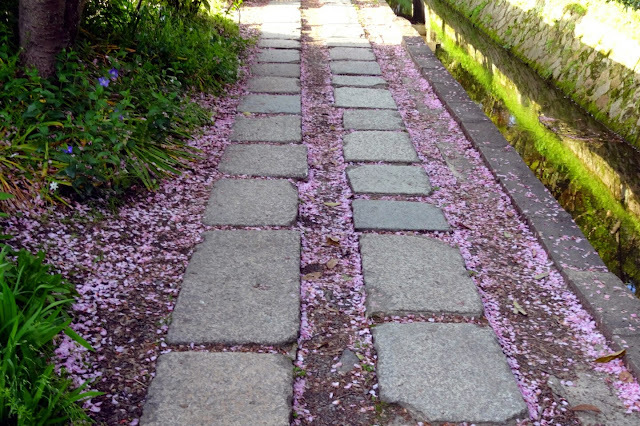 The Philosopher's path itself follows a canal and during Cherry Blossom week, there are pink flowers everywhere. Unfortunately, once again, we were fractionally too late and found green trees along the river and piles of pink petals all over the floor! 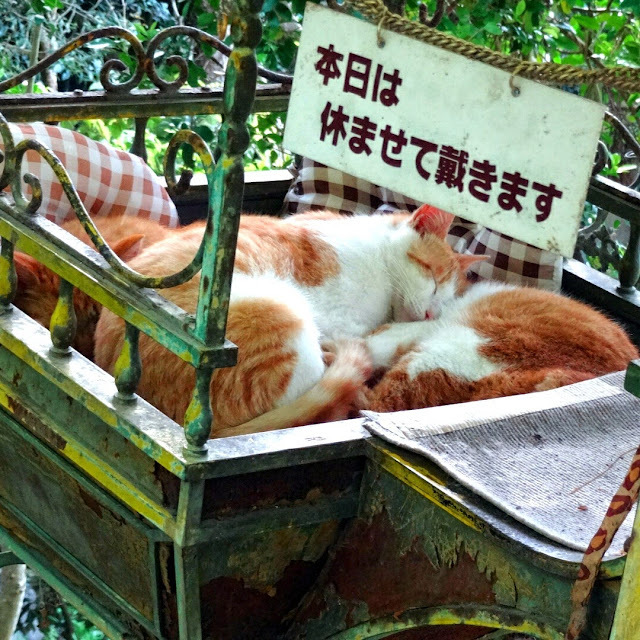 Whilst we were walking along the path, we came across a cart that had pillows and blankets inside it. Resting upon the pillows were several cats all curled up together, it was really cute! Our final stop after a long day of walking was Ginkakyji - unlike China these temples closed relatively early (5pm) and so we were too late to enter! Instead we went to a Chinese Restaurant for more eggplant (Aubergine) and rice - we were definately missing this from China. Fortunately whilst we were in South Korea, a person in our room spoke Japanese and translated a statement in Japanese for me, saying I am unable to eat meat or fish. This meant when we went to a restaurant that was unable to speak English, we could still be certain we were ordering vegetarian food - and it worked! The next day the weather was even more beautiful than the previous, with temperatures of 25 degrees and very little wind. We decided to go to another temple on the way to the subway - Rengeoin Sanjusangendo. 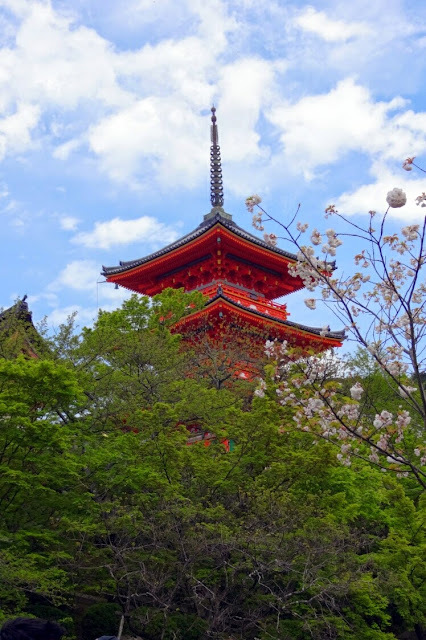 This temple was home to many statues which resembled gods and deities. We were unable to take pictures of the statues but they number of them was very striking. Lunch consisted of finding a Vegan/Vegetarian restaurant that Matt had seen on Tripadvisor. I was a little worried when I saw the menu, but the food was amazing. I had a soy meat burger and we even ended up staying for vegan pancakes with cream! 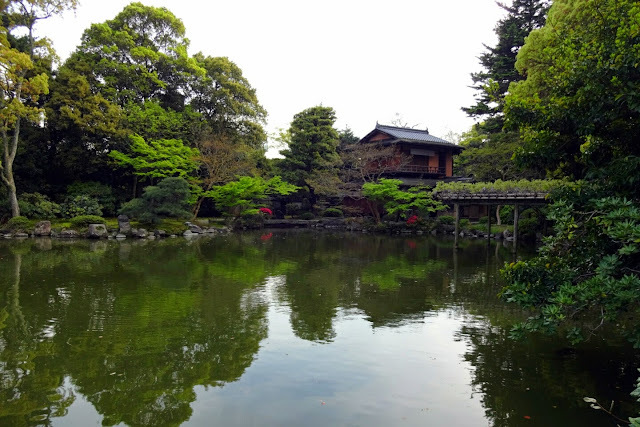 In the afternoon we went to Nijo Castle - a secondary castle to the Imperial Palace from the Shogun period. shogun literally means Commander or General and he was appointed by the Emperor to help run the country. The beat part of the palace were the squeaky floors designed to warn people if intruders were near people's room in the night! This Castle closed at 4pm and the lady on the speaker effectively told us we had to get out now! 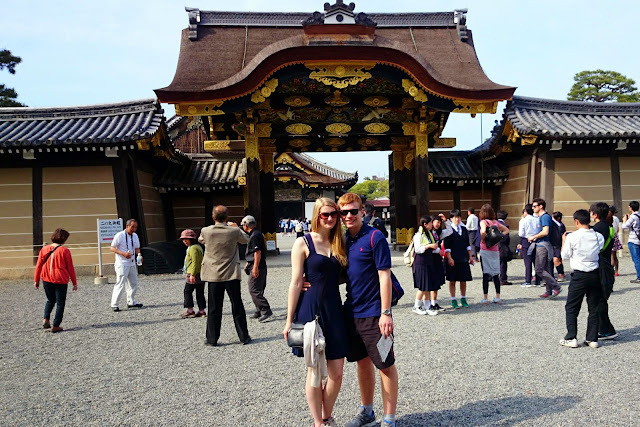 Our final stop of the day was a mile away at the Imperial Palace. In order to look around the palace, a reservation needed to be made. We did not have one of them, so instead we explored the Gardens which are open all the time! The final day in Kyoto was my favourite. We got an early start to ensure we fitted in all of Matts plans before they closed. 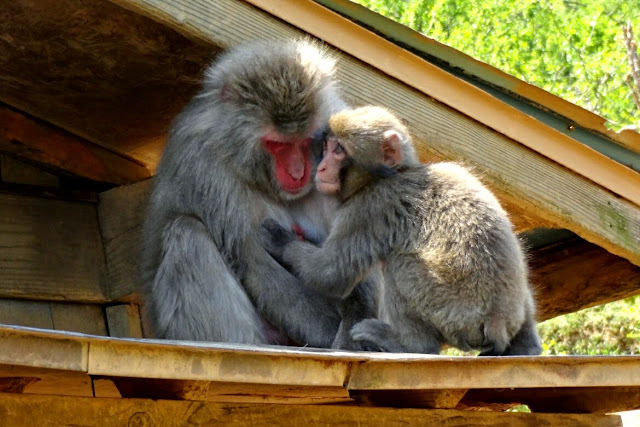 Our first stop was the Arashiyama Monkey Park. It took 20 minutes to climb up the mountain, to a height greater than that of Kyoto Tower. When we neared the top, we saw our first monkeys - two babies wrestling and their big Daddy in the tree. 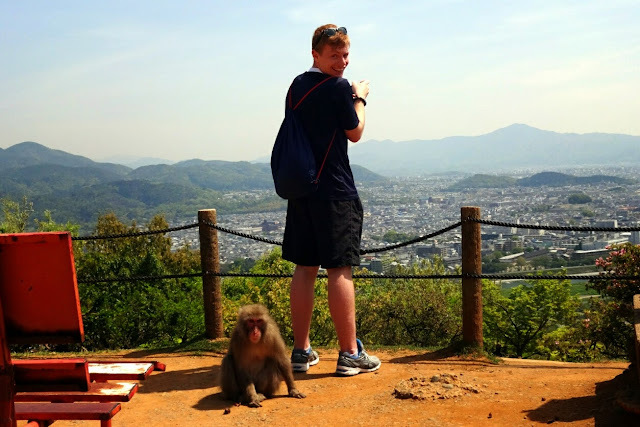 When we reached the viewing platform, I was overwhelmed by how many monkeys there were. It was also the first of many feeding times we witness, so all the monkeys in the trees were present! Although the rules clearly stated you are to stay 3m away from the monkeys at all times, it was impossible - they just kept walking past your feet. Whilst Matt was trying to take a picture of the view, a monkey sat behind him, not even half a meter away! We went inside to the feeding area where you could buy bags of apples or nuts and feed the monkeys through a wire fence. 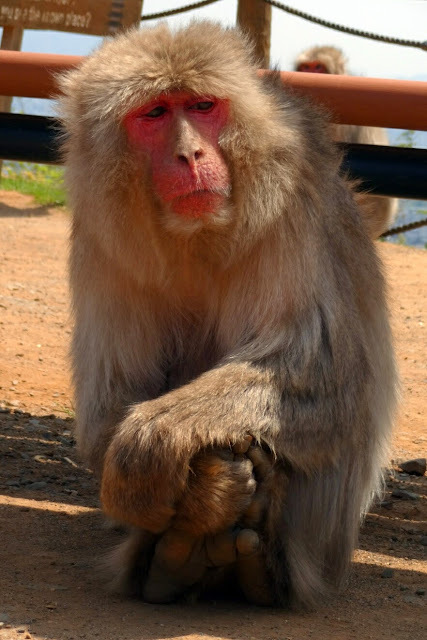 The monkeys were uber cute and grabbed the food from your hands to eat it, then stuck out their hands for more. 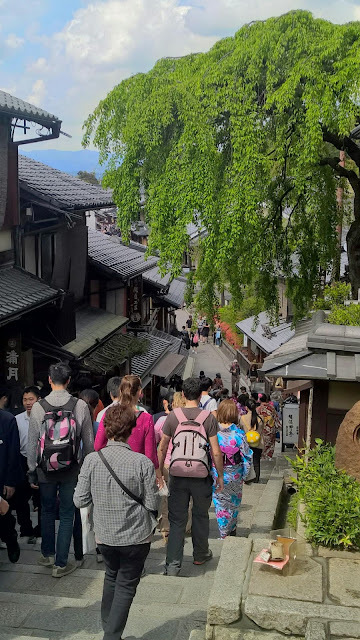 We walked across Arashiyama bridge which had a beautiful backdrop of mountains, leading to a busy tourist street filled with school children and tourists. Walking down this street we found a chopstick shop, where you can choose a design and they engraving your name in Japanese onto the chopsticks! Whilst we waited for them to be engraved, we went to the Bamboo Forest. 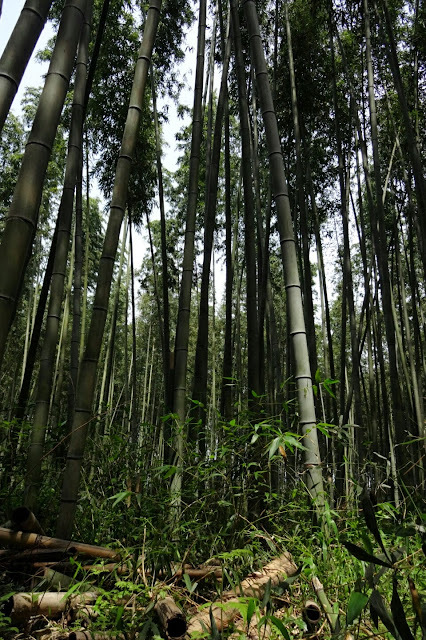 Here, huge bamboo trees grew and leaned over the path. It was really pretty, but not quite as cool as anticipated as everything was fenced off, preventing you from exploring (and I suppose damaging) the forest. 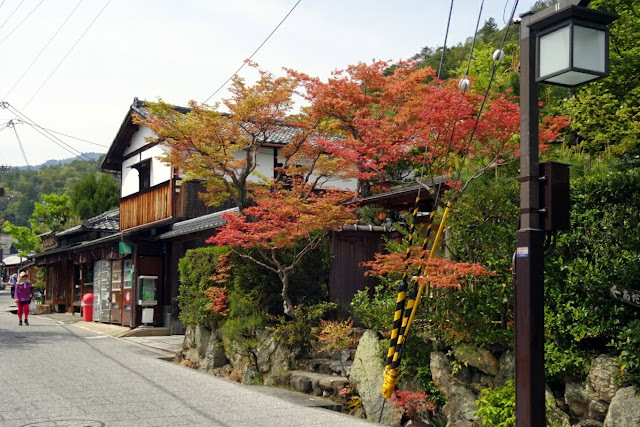 A 40 minute walk from here was the Saga-Torilmoto Preserved Street - a scenic road of traditional houses. When we arrived it was literally a ghost town - not what was expected! So we got a bus back to the river for lunch. In the afternoon we went to The Golden Temple. The Temple was very pretty and reflected beautifully in the still water surrounding it. We walked past a wishing pot where people were throwing coins - although none of my coins made it in the pot, one of my wishes did come true. When we left the complex we ran straight into a red velvet cake shop! 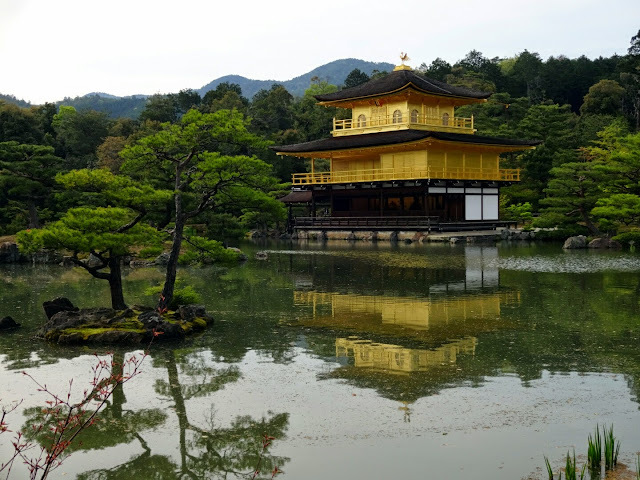 Kyoto was an amazing city with so many temples! 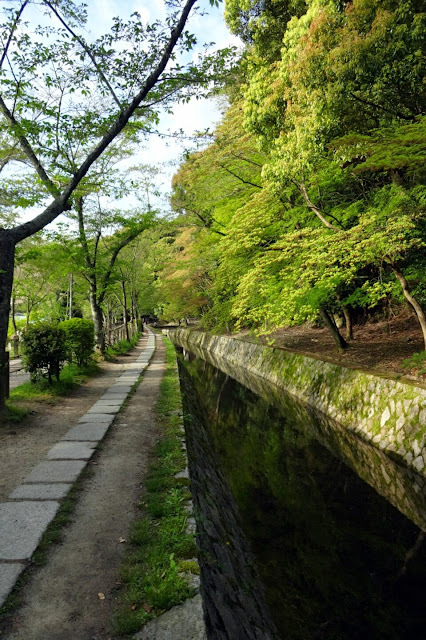 You could still feel ancient Kyoto as you walked around combined with the modern additions added to the city. It was really beautiful and one of my favourite cities I have explored.